Presbyterian Pastor Justin Hoke of Trinity Bible Presbyterian Church in Weed, California wasn't actually fired---but he was clearly told he needed to get out as pastor of the church. No. Just a biblical message that didn't conform to the current culture. A California pastor is looking for a job after facing backlash over the message he put on the church sign out front. 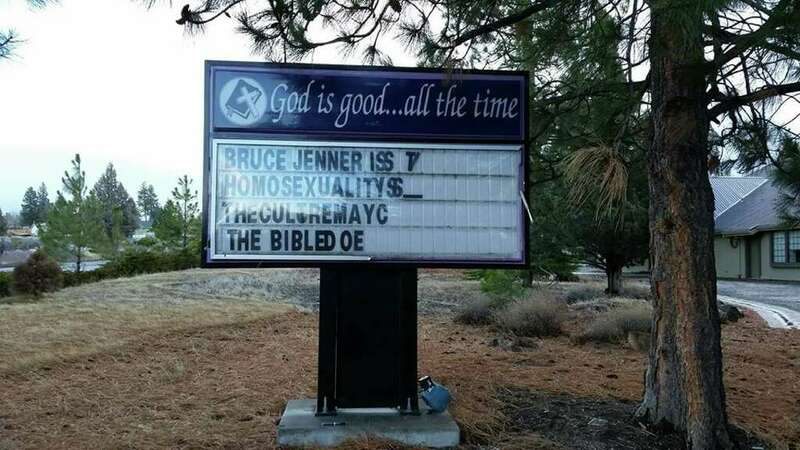 Pastor Justin Hoke of Trinity Bible Presbyterian Church in Weed, California posted a new message on the church sign a week or so ago. The sign, as you can see, is the typical signboard you see in front of churches across our country. But the message was not acceptable to the community.... or, sadly, to the church. It's not surprising that someone outside the church didn't like the message and shattered the sign last Wednesday, stealing some of the letters from the words in order to distort the message. "I woke this morning to find that our sign had been vandalized. They broke not only the plexiglas and stole some of the letters, they also busted the power box. I have not seen it up close yet as this picture was sent by a member of our congregation. Please pray that God will provide." Word spread about the "message" on the sign, which sparked protests immediately among members of the community. 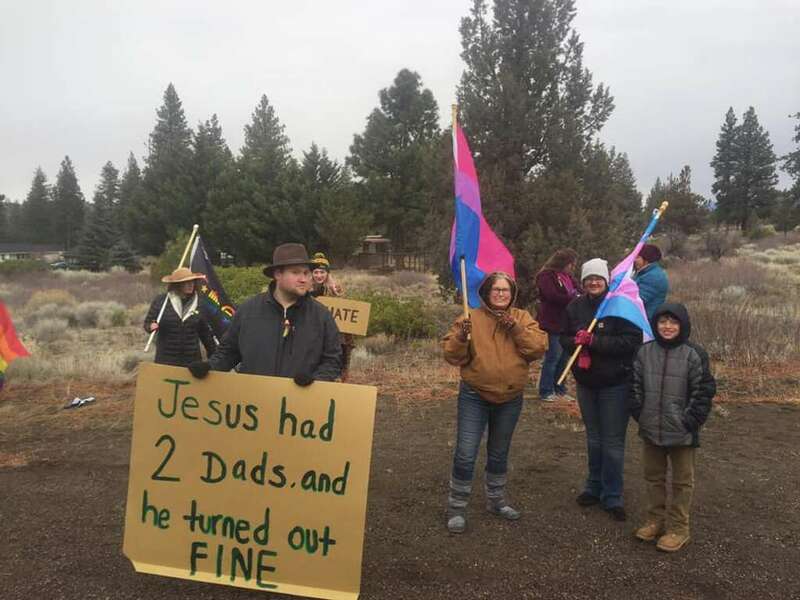 A number of demonstrators gathered outside the church for the first ever "Shastina Love Rally," which condemned the church and praised the LGBT community. Amelia Mallory, one of 3 women who organized the rally, told the San Francisco Gate, "We've really had to refine our message to be one strictly of love and support for anyone who feels like they are the target of the sign." "Debating religion is unproductive, for one, and we also don't want anyone to feel like we are against Christianity as a whole. People are welcome to their own beliefs but can't be surprised if people take action against such a display." Pastor Hoke told the SF Gate: "The ultimate purpose was to say that while the culture may change, the Bible does not. The culture is now demanding that we call 'good' what the Bible calls 'evil'." 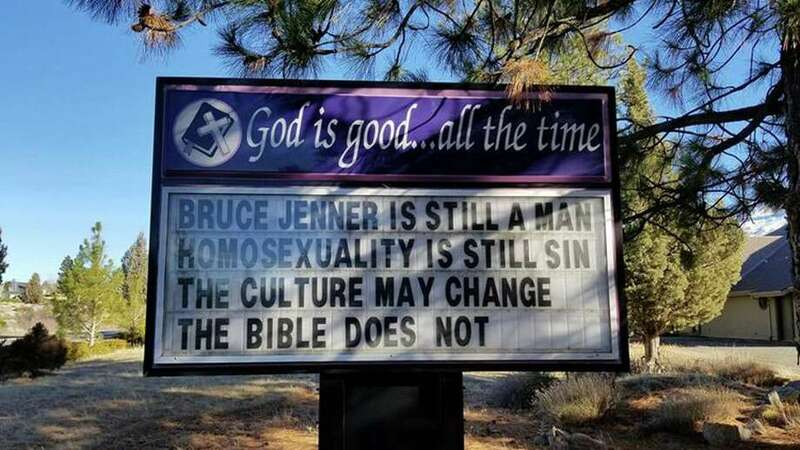 Pastor Hoke patched up the sign and put the message on display again. He said, "It's not pretty, but it's back up." A pastor standing for truth in a culture that seeks to pervert and distort the truth to affirm its behavior. Any church would be proud of a pastor who stands strong for biblical Truth, right? 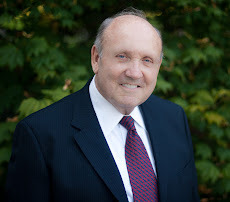 A couple of days later Pastor Hoke announced that he is no longer pastor of the church, noting that "multiple people, including a church elder, threatened to leave if he did not step down as pastor---I did not want to leave, I did not quit, and I was willing to stay," he said. But the members and the elder apparently said: "Crucify him, crucify him." "I would like to add this, I did not want to leave, I did not quit, and I was willing to stay." The pastor told the Daily Wire that he did not want to leave, but neither did he want to fracture the church. And for now, he says he is eager to preach the gospel again. 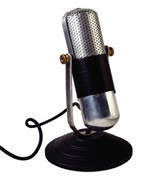 "Many people have reached out asking if they could help me in some physical or monetary way. I am really thankful for such thoughts and offers. But, I don't want to use this 5 minutes of fame as a chance to capitalize on the sympathy and good will of others. The Lord has taken care of my needs." He added, "Please pray that God will open more doors for me to preach the gospel, that is all I want or need." This is a typical snapshot of the culture deciding what the church can and cannot say. It illustrates how an unregenerate world views Christianity and religious freedom---"You can believe anything you want as long as you don't say it out loud," and if you do say things that are offensive to some, we will be there to see that their feelings are not hurt---and don't be surprised if we destroy some of your property in the process of silencing you. Another illustration that lifts off the page with this is: "We will also steal and distort your biblical words and message so people can't read or hear them." Sadly, it is also a snapshot of a delusional, conformed church. The mission of the biblical Christian Church is not to work at conforming to how people might feel about what the Bible says, rather it is to preach the unchanging gospel that will change the world. Christ did not die to raise up a church that seeks first the approval of the culture. He died to raise up a church that transforms the culture by transforming individual lives, and that transformation comes from preaching the gospel as presented by God in His Word. God bless Pastor Hoke. I'm certain God will "open doors for him to preach the gospel." I pray all who hear his story will purpose in their own life and circumstances to stand strong for God's Truth. A portion of the elect will be dragged away. Say goodbye TBPC. RIP. Summary...."We refuse to follow God's word if we don't like it"
"We've really had to refine our message to be one strictly of love and support for anyone who feels like they are the target of the sign." SO...."People are welcome to their beliefs", but "don't be surprised if people take action against such a display". "People are welcome to their beliefs and they should be free to express their beliefs "UNLESS" we disagree with their beliefs." These people represent a growing number who “walk among us”. They are unable to be rational, to either recognize or admit to truth, because they have willingly embraced deception and have as a result become spiritually blind. They are for the most part “unable” to understand reason or truth. All the scriptural prophetic references to this phenomena in being manifest in the last days…”they will trade the truth for a lie” call good evil and evil good”, etc. , are our marching orders to pray for these people. They are spiritually crippled, and born-again Christians with the Holy Spirit are not! 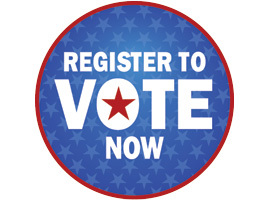 It is up to us first to pray continually for them, and for our nation. While they struggle with the hate they feel toward us, we can ruthlessly love them in return and speak short snippets of God’s truth to them so the Holy Spirit can work within them as they ponder what we have said. Truth…Hate must be embraced willingly. Hate in the name of love is still embracing hate. Hate puts up a barrier to communication, but hate cannot overcome persistent genuine love. True love is also a choice…an action word. Something we “do” not something we “feel”. Jesus spoke and acted his love to show us the way. To be “tolerant” is not loving…genuine love is expressed by word and action, and it often invites a hateful response … but we are called to endure, not to shrink back in fear off rejection or harsh treatment, and to respond to hate always with ruthless love. Only ONE couple would stay in church membership if the pastor stayed??? That's really hard to believe. If my wife and I were members, it would absolutely be US who would be staying! !